The Newberry College Music Department is very proud of our nine ensemble groups. Below is information about the ensembles. For more information about how to get involved, contact a member of the Music Faculty.  Newberry College Singers was founded in 1932, and is one of the oldest groups on campus. This premier auditioned choir tours annually and performs choral masterworks that range from the Middle Ages through the 21st century. Madrigals is an auditioned vocal ensemble that presents stunning performances of choral chamber music from a wide variety of periods. This group presents several concerts each year and tours with the Newberry College Singers. The Madrigals are under the direction of Dr. Chris Sheppard. His can be reached by calling 803-321-5181. Marching Band is a corps-style ensemble that performs at all home football games. Students traditionally write the drill and music. Newberry is the only Lutheran college in the country with a marching band. Symphonic Band performs exciting and challenging music, closing the spring semester with an electrifying concert. This select group of 40 -50 students will perform both standard band repertories as well as contemporary wind ensemble repertory designed for this smaller instrumentation. This course is open to all students, both music and non-music majors and may be repeated. Required for all instrumental majors. The Jazz Ensemble (Big Band) plays several concerts each year and tours in the spring semester. Their energetic performances have been recorded on numerous CDs. Newberry College hosts the statewide SCBDA Jazz Festival. The Jazz Combo is a small jazz group which performs frequently at on and off campus venues, and performs regularly at jazz festivals. The group offers students many opportunities to work on jazz improvisation. Woodwind Ensembles include saxophone ensemble, clarinet ensemble, flute ensemble, and woodwind quintet, depending on studio personnel. These groups perform in their own concerts as well as at special events on campus. Percussion Ensemble plays inventive arrangements for a wide variety of percussion combinations. Brass Ensemble performs at a number of events, including college convocations. Guitar Ensemble is small ensemble of guitar and non-guitar majors who perform music from Renaissance to Modern to Popular genres of music. The Newberry Chamber Orchestra is a town and gown orchestra and is open to both Newberry College students and community members. The NCCO performs music from Baroque to 21st century literature. The Newberry Chamber Orchestra is under the direction of Dr. Patrick Casey.